4) Discovery Supports Da Vinci Code Claim! This conditioning is serious and is designed to prepare the way for Antichrist! As we stated in NEWS2192, the real danger in this bogus claim by Hollywood Director James Cameron (33rd Degree Mason) that Jesus' body had been discovered was that this lie would be repeated countless times after the original story had broken. In these "aftermath" stories, only the controversial subject would be presented, and it would be presented as fact, not hypothesis. Furthermore, no contrary view will be presented during these countless times when the controversial view is presented by some form of Mass Media -- in direct contrast to the original breaking of the story. During the first breaking of the story, contrary viewpoints from numerous other experts were offered, alerting the reader and/or the listener that this exciting new "discovery" might not be true after all. We noted that this "aftermath" scenario would proceed according to the insidious, almost invisible, attitude conditioning program known as the "Six Step Attitudinal Change Program". 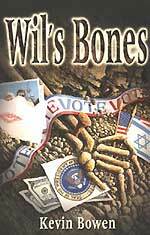 As you will see, the presentation of the "Jesus' Bones" story is being widely disseminated uncritically. This statement presupposes that this article is going to present another kind of resurrection -- which it truly does! Key word is "really". This one word casts doubt in the mind of the person who is not a firm believer. By casting this disputed discovery in the category of " Greatest Archaeology Find of All Time", this article confers great legitimacy upon this supposed discovery. During the original presentation of "Jesus' tomb", no one actually said that DNA tests conclusively proved anything, as James Cameron and other experts had to be much more circumspect because they were dodging bullets from equally adept experts who were throwing cold water on every detail. However, since this article does not print any negative report, its authors are free to present the material as boldly as they want to, which they do very strongly. If a person believes that Jesus' DNA was discovered in that ossuary box, and that it matches supposed DNA on the Shroud of Turin, that person will likely believe this story. That person will likely lose his faith in Jesus Christ, especially those who had little, or weak faith in the first place. 4) Discovery Supports Da Vinci Code Claim! This is a heavy-hitting claim, and may be the core purpose of this entire charade. While over 60 million people read Dan Brown's controversial book, most people believe that it is just fiction. Interesting fiction, but fiction nevertheless. However, if this fiction can be married to substantial archaeological discovery, then hundreds of millions of people around the world will find reason to believe the Da Vinci Code lie. Remember, Antichrist cannot arise until a substantial percentage of the peoples of the world believe in the Da Vinci Code lie. We bring this fact out strongly in our archived Headline News article, NEWS2123, "DA VINCI CODE" MOVIE BREAKING MAY 17-25 THROUGHOUT THE WORLD -- MOVIE IS SURE SIGN OF THE APPEARANCE OF THE "MASONIC CHRIST" - Unless people believe the lie taught by the DaVinci Code, they will not believe the "Masonic Christ" when he arises! Matthew, Chapter 1, is in the Bible precisely because Messiah must prove his lineage back to King David -- the DaVinci Code does this for the Masonic Christ." Now, let us examine the entire article; prepare yourself for some terrible lies being told about Jesus. "The discovery of a tomb that may have contained the earthly remains of Jesus Christ and His family has split the Christian community in two. Archaeologists found the tomb at a construction site in a Jerusalem suburb in 1980. They catalogued the contents of the underground burial chamber -- 10 ossuaries, or 'bone boxes', each containing skeletal remains -- and stored them in a museum. The bones themselves were immediately turned over to Israeli authorities to be quickly reburied, according to Jewish law." "At the time, the scholars noted that six of the ossuaries had names etched on them: Jesus, son of Joseph; Maria; Mariamene; Matthew; Judas (possibly 'Judah' because time has partially obscured the last letter), son of Jesus and Jose, a variation of the name Joseph ... more than 20 years later, investigative journalist Simcha Jacobovici concluded that it was not coincidence that the names -- those of the key figures in the drama of Christ's life and death -- were found in the same burial plot and all dating to the 1st Century." "He enlisted the help of statisticians, archaeologists, historians, theologians, DNA analysts, linguists, a crime scene investigator and film director James Cameron ..."
Since the first step of the Six Step Attitudinal Change Plan requires a RESPECTED expert speaking from a RESPECTED forum, from which he will deliver the controversial subject, it was necessary to arrange for this kind of a lineup of RESPECTED EXPERTS. The majority of the undiscerning people of the world will look at this list of experts and immediately place great faith in the conclusions of the panel, and of the book and the documentary which James Cameron produced. These people will never stop to think that, just maybe, these panelists were secret society members who have a common hidden agenda. 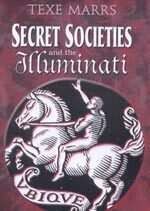 We know that James Cameron is a 33rd Degree Mason, so it is possible that this panel of experts are similarly imbued with the same silent agenda. "Their report, which has been made into a TV documentary, stunned the world: the tomb contained the bodies of Jesus, His mother Mary (Maria), His earthly father Joseph, Mary Magdalene and -- most shockingly -- his son Judas, who died at the age of 4, evidence indicates ... although the skeletons had been removed from the ossuaries and reburied, there was enough DNA left inside the boxes to confirm that the ossuary labeled 'Jesus' was not related by blood to the one whose remains were encased in the box labeled 'Mariamene' ..."
Later on, this article returns to the subject of DNA testing. "One additional fact remains to be explored more fully, Zeitz says. 'I have reliable information that preliminary DNA tests prove that the body buried in the ossuary labeled 'Jesus', and the body wrapped in the Shroud of Turin were one and the same', he explains. 'This means that the skeleton once buried in that box must be found and compared to the image on the Shroud. If they match in height and other physical dimensions, that would be final proof that Jacobovici's astonishing theory is correct." My Daddy used to say, "Figures don't lie, but liars figure". This bit of folk wisdom precisely describes this lying scenario! For centuries, people have tried to prove that Jesus did not die, that He got out of the tomb, went into the village, married Mary Magdalene, and had children. 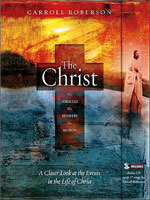 But, no one could ever prove it, even those enemies of the Cross living in that time period. Were Jesus' body ever really produced, Christianity would have died in a heartbeat! The most professional Roman government could have squashed Christianity if they had produced the elite special forces who were guarding Jesus' tomb, and had these men tell the world that they had been bribed to let Jesus out of the tomb. Belief in a resurrected Jesus energized the early Christian Church, but if anyone had been able to produce a dead body, Christianity would have collapsed overnight. Both the Jewish leadership and Roman authorities hated Jesus and tried to destroy His church. If they could have produced a dead body, they would have won a mighty victory, a victory they vainly sought over the next 300 years of turmoil and bloodshed. Now, we are seeing modern-day liars trying to destroy people's faith in Jesus Christ. Let us now go back to our Sun magazine for additional blockbuster lies. This first article tries to convince people that the discovery of this tomb was actually foretold in the Bible. "In the Gospels, Jesus' most devoted disciple Peter denied knowing the Savior three times as Christ was being scourged before His crucifixion. One of the first archaeolologists on the scene after a construction crew unearthed the tomb in a Jerusalem suburb in 1980 denied remembering the event -- three times. Prominent Catholic theologian, Father Jerome McGuire refuses to believe this is a coincidence ... 'I think the divinely inspired authors of the Gospels knew this tomb would be discovered and left as a clue in Peter's three-fold denial of Christ', McGuire says." What nonsense! As I read this article, I was stunned at the flimsy nature of the "fulfillment of Bible prophecy" related here. Secondly, if the disciples knew that this tomb existed, and believed it would be discovered at the End of the Age, they would have known that they served a dead Christ, a powerless and impotent mere man, and that the entire edifice of Christianity was a blatant fraud. Since no man ever bears torture and excruciating pain for a lie, these disciples would have abandoned the Christian faith at the very beginning. But, their resolute determination in the face of the most brutal torture known even today, is proof positive that these men absolutely believed in Jesus' resurrection. And, why should they believe anything else? They witnessed Jesus' heart being skillfully punctured from the Centurion's spear through his side, and then they saw the risen Savior three days later, an appearance which culminated in His ascension into Heaven 40 days later. They knew He was alive! Therefore, this Roman Catholic "prominent theologian" is simply lying through His Jesuit teeth! This next article recognizes the linkage of this stupendous lie and the Da Vinci Code. "The new evidence that Jesus and Mary Magdalene married and had a family lends startling credence to Dan Brown's best-selling novel, 'The Da Vinci Code', and the movie based on it. In this book, Brown claims that the Vatican suppressed knowledge of the marriage and the offspring it produced ... 'If the child's body found in the ossuary labeled Judas, son of Jesus, is in fact the son of Christ, it proves that He and Mary Magdalene did have at least one child, says esteemed theologian Dieter Zeitz." At the very time when world events are moving toward fulfillment of dozens of End of the Age prophecies, we should not be surprised to regularly hear stories which will enable Antichrist to arise on to the world scene. 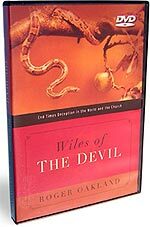 Brown's "Da Vinci Code" aids Antichrist greatly in his deception of Christians and Jews; therefore, we should not be too surprised to hear this kind of propaganda raising its ugly head. 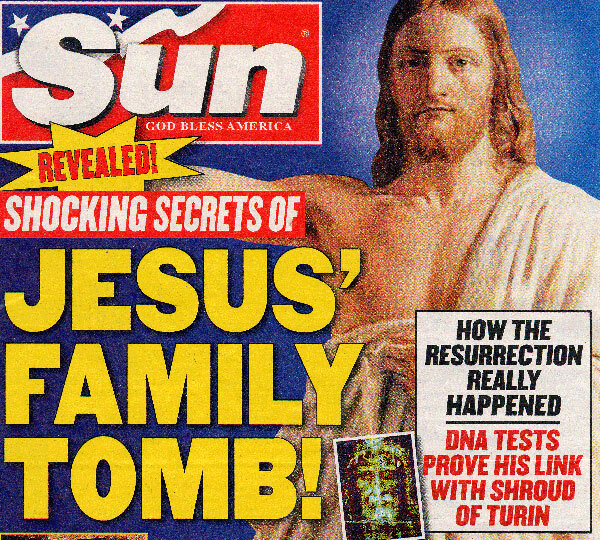 Likewise, this "discovery" of Jesus' tomb, and the masterful propaganda pieces like these in the Sun tabloid, are timed to coincide with other Antichrist propaganda. Can the planned World War III which will produce Antichrist be far behind?